Eight NCCU alumni have risen to the very top of higher education administration as president or chancellor of a university. One among this select group was Dr. S. Dallas Simmons '62. Simmons served as president of two institutions, Saint Paul's College in Lawrenceville, Va., and Virginia Union University in Richmond, Va. But it was North Carolina Central University that gave him his start  and he never forgot it. When he passed away, he bequeathed $250,000 to NCCU from a life insurance trust funded by Dominion Resources, Inc., for members of its Board of Directors. He served on the Board for 15 years. The funds were used to establish The Simmons Endowed Scholarship. The life stories of great leaders in our community tend to focus on their accomplishments but there is often more underlying their success than is recorded in their biographies. The Simmons story is one of a strong, married couple that embraced the challenges of leading two historically black colleges together, as a team. 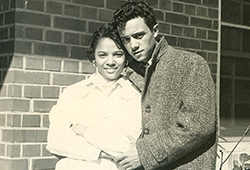 Dallas met Yvonne Martin at NCCU in 1958. Enrolled together in the business Bachelor of Science program, they graduated in 1962 and were married in February '63. Their first jobs were on campus. Dallas was manager of data processing and Yvonne was a secretary to the dean of the undergraduate school. The couple relocated for a few years to take similar positions at Norfolk State University, before returning to NCCU in 1967  this time, as a family of three. Son S. Dallas Jr. was born in 1964, and Yvonne became a working mother long before it was commonplace to do so. At NCCU, Dallas taught and began studying for his master's degree in business. Meanwhile, Yvonne provided the primary financial support for the family, working as a secretary in the NCCU Business Department and, later, for the vice president for financial affairs. In 1968, Dallas graduated with his Master of Science degree. Daughter Kristie was born the following year. In 1971, Dallas was offered the position of assistant to the chancellor, allowing Yvonne to leave her secretarial job for a more flexible teaching career at Durham Technical Institute. She earned her M.S. in business at NCCU in 1974. On the strength of his work at NCCU, Dallas was awarded a Government Service Fellowship from the State of North Carolina to pursue graduate studies at Duke University, and received his Ph.D. in education administration in 1977. Shortly thereafter, he was promoted to vice chancellor for university relations at NCCU. In 1981, Dallas was appointed president of Saint Paul's College. According to Yvonne, Dallas admired and often credited his NCCU mentors for his success. He would mention Dr. Helen Edmonds, dean of the graduate school; Dr. Leonard Robinson, dean of the undergraduate school; William Jones, vice president for financial affairs; Dr. Alfonso Elder, president; Dr. Albert Whiting, president and chancellor; John Turner, professor in the School of Business; Alex Rivera, director of public relations; and Dr. Marion Thorpe, dean of students. "He admired these people and he knew early on that university administration was something that he wanted to do," said Yvonne. At Saint Paul's and also VUU, Yvonne continued to teach while serving in the unique role of First Lady of a historically black college. "I was his event planner and constant companion at fundraising activities," said Yvonne. "We entertained the board, faculty, staff and students. It was really all about trying to make a difference in the lives of young people and the community." According to Yvonne, Dallas brought financial stability to both institutions. At VUU, where Dallas served as president from 1985 to 1999, he delivered a litany of stellar accomplishments, including overseeing the construction, purchase and restoration of several buildings. Skillful fiscal management and successful fundraising were pillars of a Simmons administration. Dallas Jr. followed in his parents' footsteps by attending NCCU. He graduated from the School of Business in 1986 and is now a certified public accountant. Kristie graduated from Spelman College and received her law degree from the University of Virginia. The Simmons Endowed Scholarship was established in the names of Yvonne Martin, S. Dallas and S. Dallas Simmons Jr. to support a business major in financial need "who is willing to work hard, is involved in campus and community activities, and exhibits leadership qualities,"  in other words, someone much like Dallas and Yvonne. "We worked together to accomplish our goals," said Yvonne. "We shared a wonderful life together surrounded by a loving family and loyal cherished friends. We were blessed. That's how Dallas would describe himself, as being blessed." NCCU will be forever grateful that the Simmons family elected to share their blessings with our deserving students.